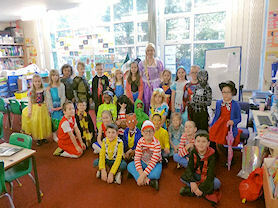 On Thursday 7th March we all celebrated World Book Day. 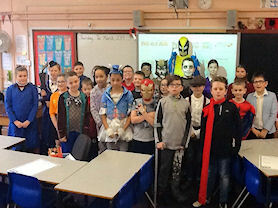 Everyone dressed up as their favourite book character and there were some amazing costumes. We had book characters such as Harry Potter, Cinderella, Paddington and even The Big Bad Wolf in Grandma’s clothing - did you guess which teacher it was? Each class focussed on reading and enjoying new stories and poems. Year 5 spent time reading to their Guardian Angels and Year 3 went down to read stories to Year 1. 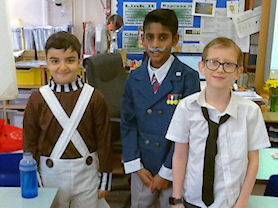 Year 3 had a ‘marvellous’ time carrying out Science experiments as they are reading ‘George’s Marvellous Medicine’, whilst Year 6 shared and recited their favourite poems. The teachers in Year 5 told their classes about their favourite books and the children drew a map of the story. 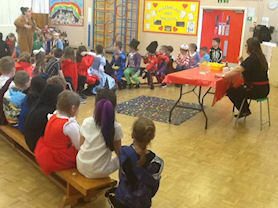 Everyone was very busy and the day reminded us all about how much we love books and how important reading is! Content and Images © 2018-, Holy Souls Catholic Primary School.